What a wonderful day we had at the farm -- some sun, some rain and some wind across our wakeful hours at the farm. We have been busy this week with fall transplanting, direct seeding and, of course, harvesting and weeding. The weeds did get ahead of us in the last few weeks, but when we do "power weeding" together with all of us focused on 30 to 4O minutes on one location we can make recognizable progress. Nothing beats a good power- weeding group with all of our hands and tools grabbing at the weed roots and good conversation from all sides. This evening we convened our second Pizza on the Orchard . 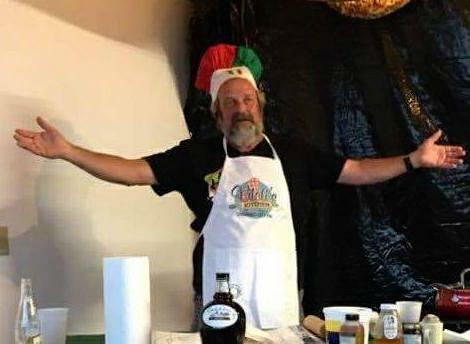 Jeff Vitali is our pizza cook this year. Jeff is a farm hand at Amador Hill and an Italian family cook from Lindstrom. We are trying to create a truly local pizza with local staff and local fresh farm ingredients. This week we are pleased to announce that Eichten’s Artisan Cheese in Center City is a new North Circle farm and new source for local pizza cheese. All for now. Enjoy the box and the recipes. 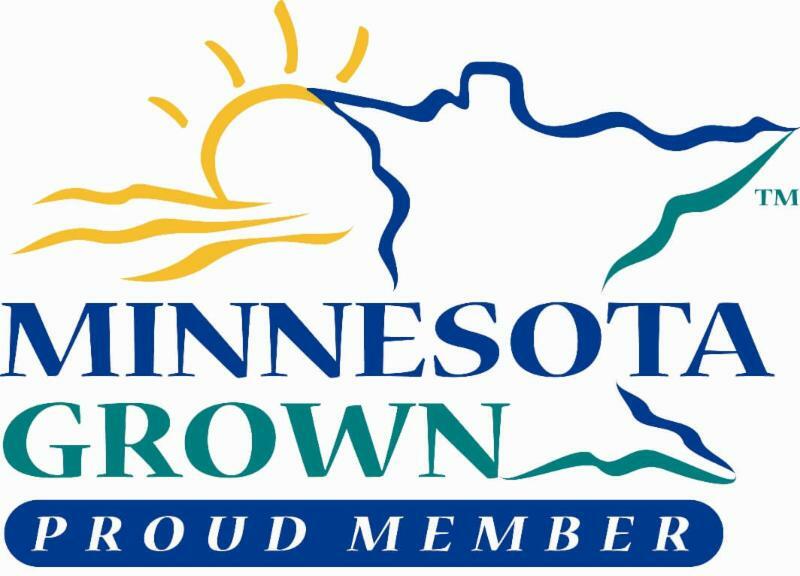 ﻿T hank you for returning your CSA boxes. LATE PICK UP TIPS: I picked up my box very late on Friday and by that time the Watercress were fairly wilted. When I got home I plunged them in cold water for a few minutes, and spun them dry. They perked up and I’ve been eating them all a week - the few that remain in my refrigerator still look great. If you pick your box up later in the day like I do and find your greens wilted, try a cold water wash and store in plastic with a paper towel. Or for smaller bundles of arugula or watercress, place ends in water like a bouquet and leave at room temp. You can also freeze many of the greens like Kale, Chard, Carrot and Beet tops, just wash thoroughly then blanch ( drop into boiling water for 1-2 minutes), drain well and pat dry, then lay evenly in a zipper bag in the freezer. I save a little bit of all of my greens for freezing so that I have plenty of them over winter for stews and juices. Garlic season begins! And Amador Hill Garlic is something quite special! Grown and harvested with great love and care by our garlic farmer Hilary, unlike any garlic you guy in the store. We grown many varieties and Georgian is the first we introduce to you this year. 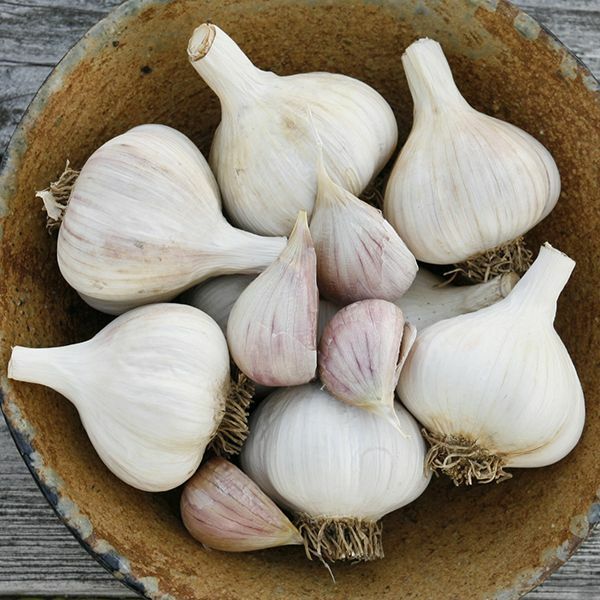 Storage: When kept in in a cool dark place your garlic will last through winter. The first carrots of the year! Farm fresh carrots are nothing like the carrots you buy in the grocery store. You may choose to roast your carrots but please do save some for the joyful experience of snacking on raw farm fresh carrots – so sweet and so crunchy, you will love them! Don't forget the carrot greens, use them like you would Kale or Swiss Chard, it has a wonderful flavor and texture. To make a healthy carrot top juice or smoothie, use a food processor to puree 5 oz carrot greens, 2 carrots, 4 baby apples (cored), 1 cucumber, 1-3" piece of fresh ginger root peeled (depending on your taste), juice from one lemon. Drink as a smoothie, or if you prefer less pulp, strain with cheesecloth or a food mill. Storage: Remove the green tops and store them unwashed in a plastic bag for about a week. 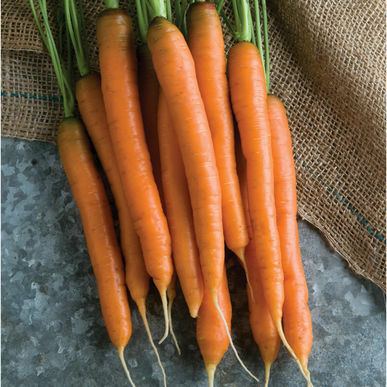 Refrigerate unwashed carrots in a sealed bag on your refrigerator shelf for up to 2 weeks. 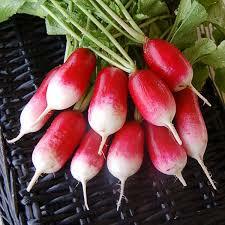 A classic round red radish, crisp, very crunchy and intensely flavored. Antibacterial and antifungal properties in radishes make them quite worth the heat! To mellow them out, try roasting your radishes - see recipe below. 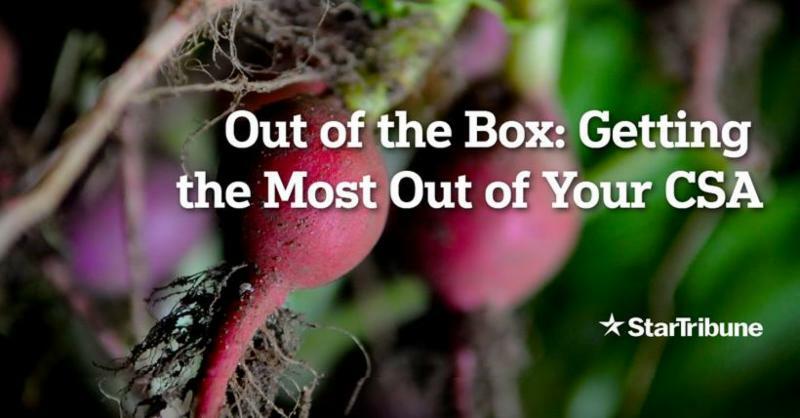 Storage: Remove the rubber band and remove the greens from the radishes. Store greens and radishes separately, unwashed in plastic bags in the crisper drawer of the fridge. Greens will last only a few days and radishes will last for a few weeks. Greens are full of nutrients, use them mixed into a Kale salad. A longer, paler, and milder radish. 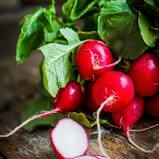 Radishes act as a natural decongestant, so if you are fighting a summer cold, try mincing these milder radishes and spreading on toast or steep for a strong tea in the morning to open up your sinuses. 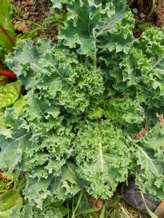 Starbor Curly Kale has a sturdy and deeply curly leaf that is perfectly suited for holding and delivering your favorite salad dressing. Add slivered carrots and radishes for an extremely healthy sweet and spicy salad. 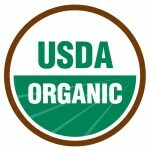 Storage: Remove rubber band, wrap kale bundle in damp paper towel and store unwashed in a plastic bag for 7 to 10 days. 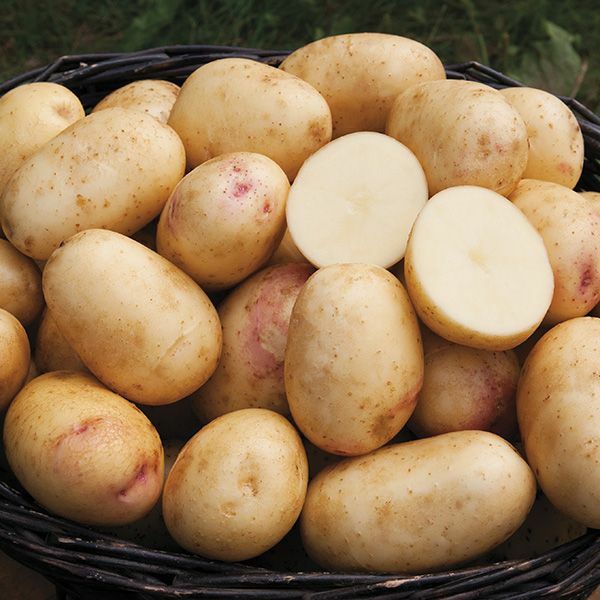 These medium sized pale potatoes have a rich butter texture, delicious earthy flavor and a delicate skin. Yukons are wonderful for potato salad, serving gently boiled with a little butter or roasted on the grill. See Farm share Recipes and Tips below for a Potato - Carrot recipe that is sure to please. Storage: Stored in a cool dark place these potatoes will last for several weeks. When you cook your potatoes, keep the skins on for flavor and added fiber. Give a gentle wash just prior to cooking. 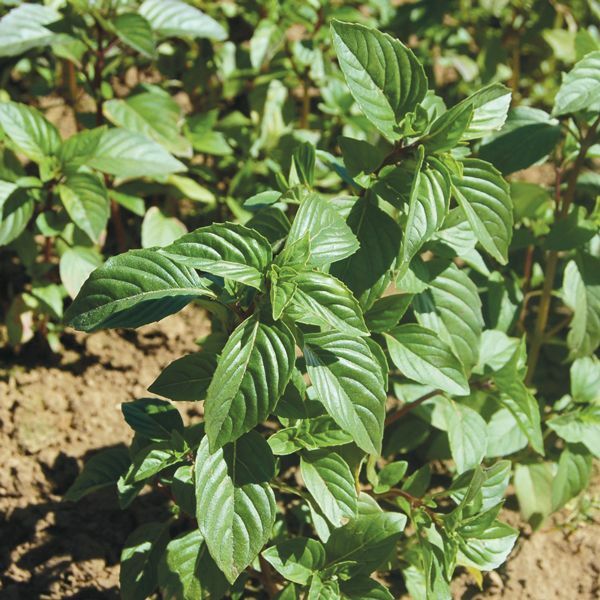 Thai Basil has narrow leaves, purple stems and a distinct flavor that resembles anise or licorice. It holds its flavor well when cooked. Used for asian stews, soups, stir-fry. It is exceptionally delicious with Vietnamese Vermicelli Salad , a simple summer dish. Genovese Basil is an excell ent standard sweet basil variety with large leaves and potent flavor. 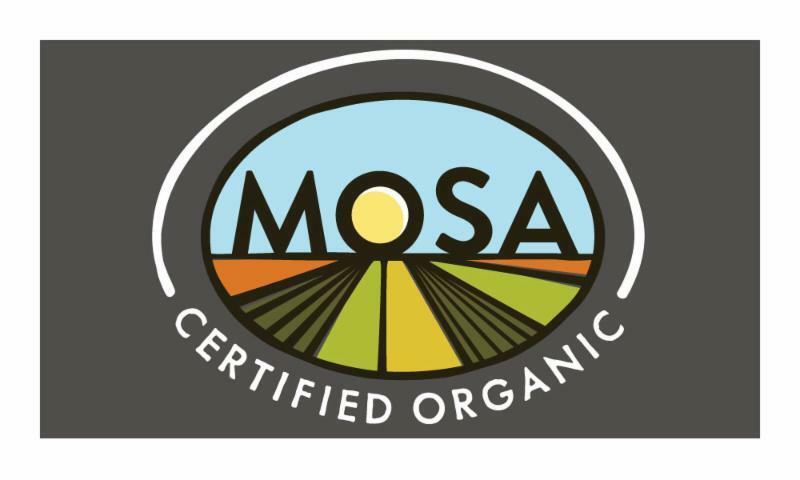 We will distribute basil randomly throughout the CSA boxes packed this week, you will get one the other variety. Storage: Remove the rubber band from the herb bundle, make a fresh cut in the ends of the stems and place in a jar of water like a flower bouquets. Store like this at room temperature for several days. Basil is sensitive to cold and may not do well in your refrigerator. Rosemary is a highly aromatic and pungent herb with an earthy flavor that compliments pork, fish and game as well as starchy dishes like pasta or potatoes. 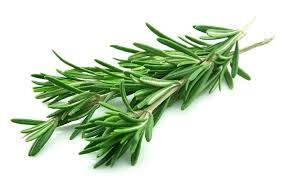 Rosemary is abundant in antioxidants and vitamins A, C, B6 and more. Known to aid in hair and scalp health, heart and brain function and exceptionally good for gut health. These are just a few of the impressive health benefits of this potent herb. Consider using the Rosemary Roasted Potatoes this week. Storage: Remove the rubber band from the herb bundle. Rosemary is a sturdier herb than basil, so you can store this in the refrigerator, unwashed, wrapped loosely in paper towel in a paper bag for several days. It will also do well in a vase like the basil. Green Baby Apples -- once again. 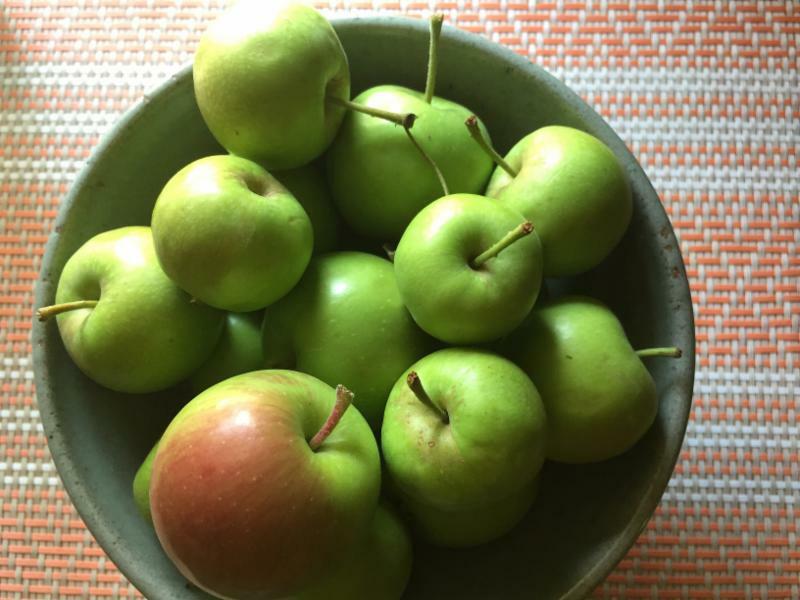 Culled Apples are the immature apples picked early in the season to thin the harvest, which allows the rest of the tree’s apples to grow larger and healthier. Tart and crisp, use as you would Crabapples or Granny Smiths. Storage: Store in your vegetable drawer of the refrigerator for a couple of weeks. In addition to the list or produce described above, you'll see some of familiar items like various cucumber and summer squash and green onions (scallions). The head of garlic is Georgian Crystal, which has nice, large, easy to peel cloves. Fresh from the field, it is fairly mellow and adds a bit of heat to pesto. Put in the blender and make it as coarse or as smooth as you want. You can make it your way, with your choice of nuts and cheese. The classic nut is pine-nut, but that is because the original Italian cooks went into the pine woods to collect them for free. Today grocery stores mark them up to a high price. So choose whatever you want. Equally, the classic cheese is Parmigiano, but some people find that too salty. 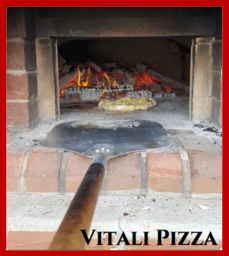 Pizza on the Orchard with Vitali Pizza!